I have hand made the exercise with svg. See attachment. It was very cumbersome. If I could write the étude in markdown and then do pandoc magic I could perhaps learn how to create a library of basic exercises. As simple as possible, but also as "schoolbook-like" as possible with Andika's open four, seven with a bar etc. 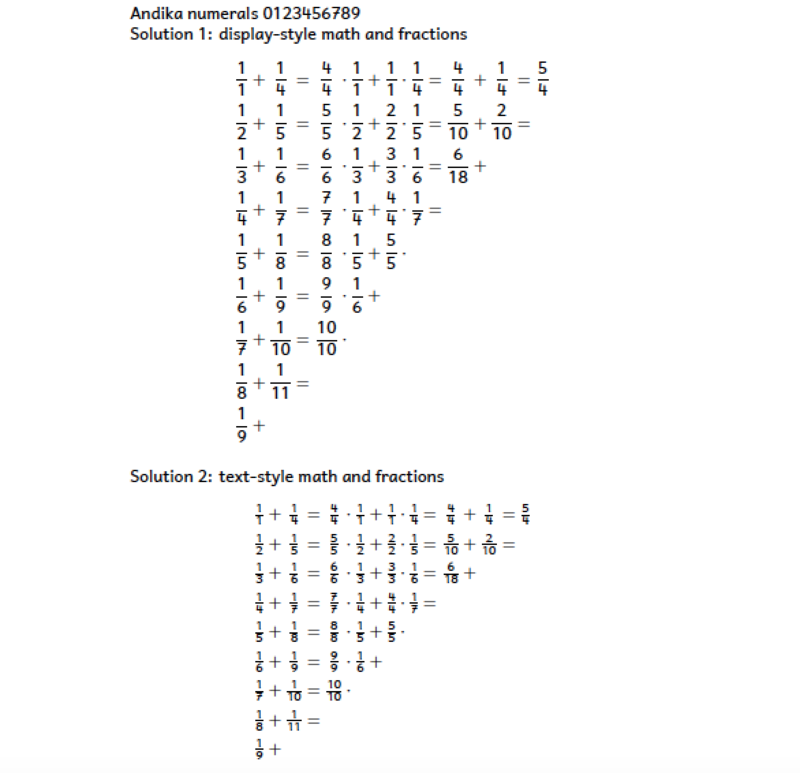 If I could make such a fractions exercise with Andika without having to program svg, that would be fantastic! This works only for XeLaTeX. If you need a solution that works with LuaLaTeX see Mico's answer. You can use otfinfo -f Andika-R.ttf to list all available font features. Multiple option values can be set with a simple YAML sequence. Here's a solution that works with both LuaLaTeX and XeLaTeX, while using the non-default variants of the numerals 1, 4, 6, 7, and 9. In addition, it employs an array environment, to help align all fraction terms, + symbols, and = symbols horizontally as well as vertically. Observe that since Andika is a text font, not a math font, only the numerals in the math terms employ Andika; all other glyphs (such as + and =) are rendered using Latin Modern Math. 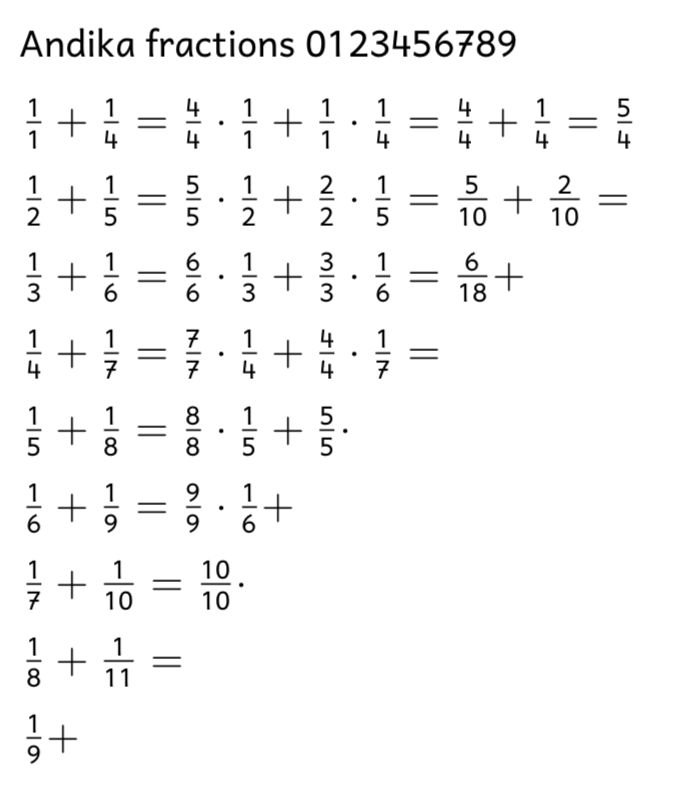 The code below actually presents two solutions, rather than just one solution. 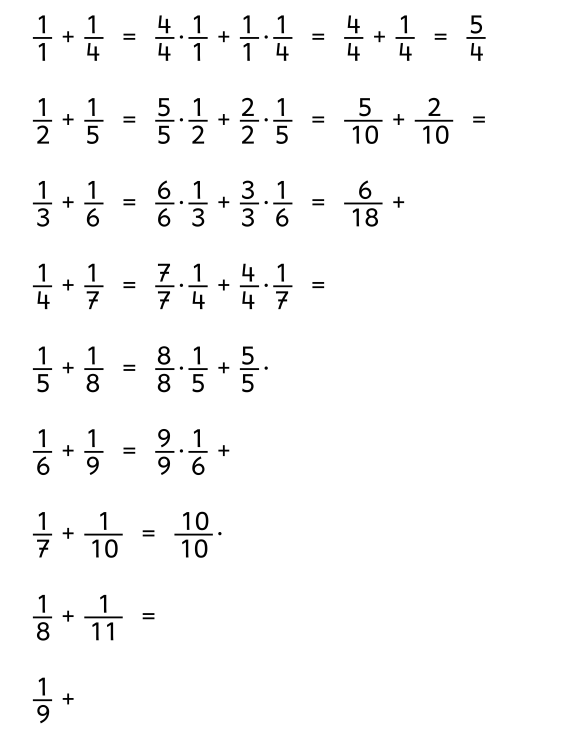 The first uses display-style math, while the secod uses text-style math. The difference is most readily apparent in the size of the \frac terms. Not the answer you're looking for? Browse other questions tagged fonts xetex luatex fontspec pandoc or ask your own question.